1 Homes devastated by fire and effects of Hurricane Sandy at the Breezy Point section of the Queens borough of New York, October 30, 2012. 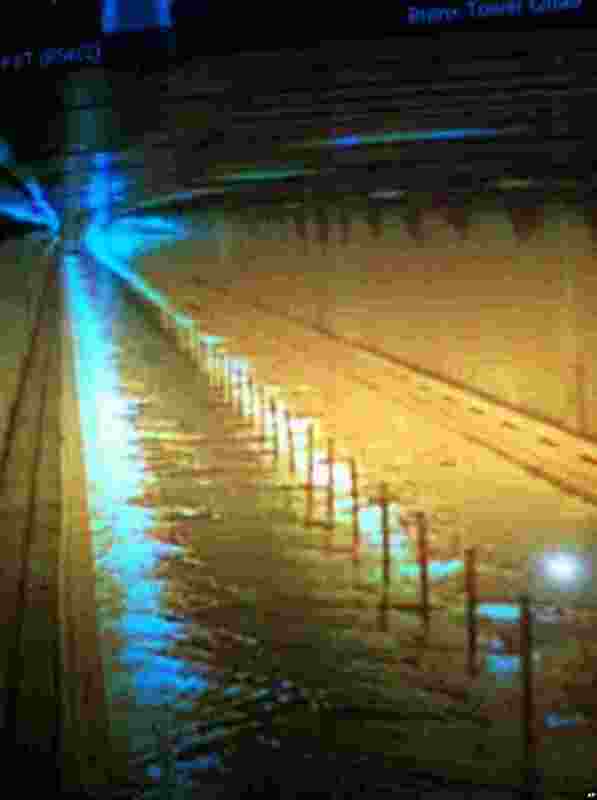 2 Water reaches the street level of the flooded Brooklyn Battery Tunnel, October 30, 2012, in New York. 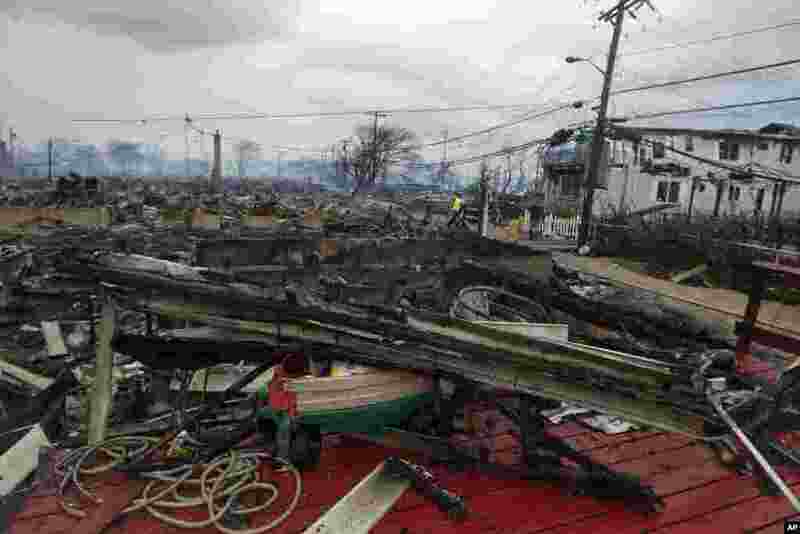 Superstorm Sandy arrived along the East Coast putting more than 7.5 million homes and businesses in the dark and causing a number of deaths. 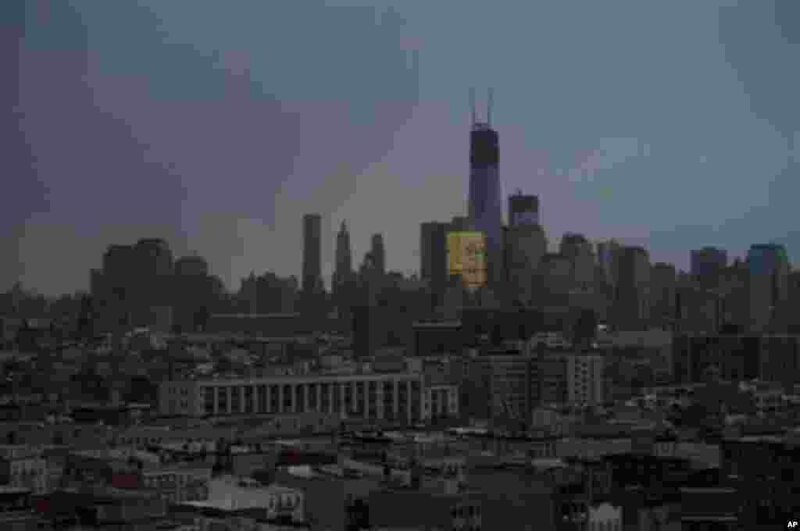 3 One World Trade Center and large portions of lower Manhattan and Hoboken, New Jersey, are seen without power from Jersey City, New Jersey, October 30, 2012, the morning after a powerful storm flooded the subway system, shuttered financial markets and left hundreds of thousands without power. 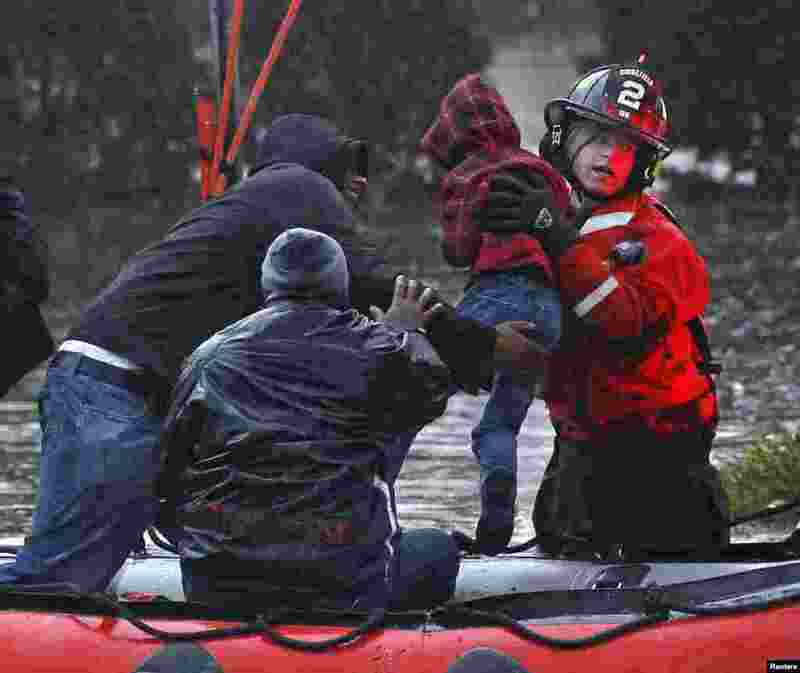 4 Residents, including a young child, are rescued by emergency personnel from flood waters brought on by Hurricane Sandy in Little Ferry, New Jersey, October 30, 2012. 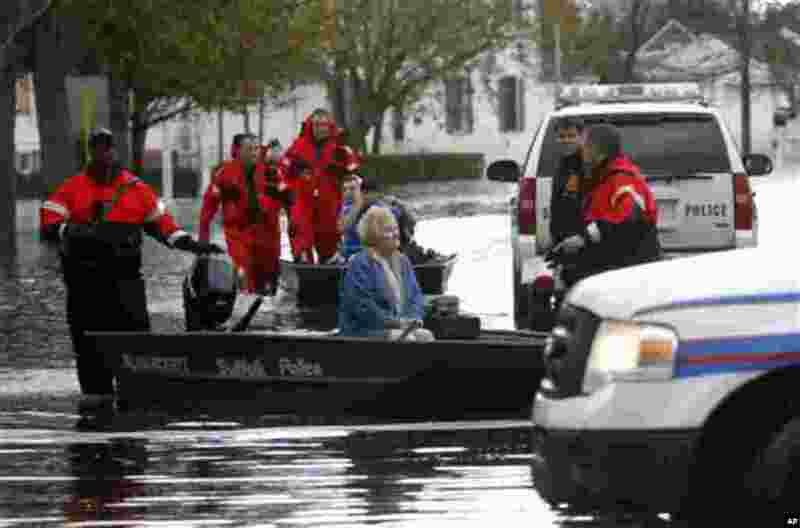 5 A woman is lifted into a National Guard vehicle after leaving her flooded home at the Metropolitan Trailer Park in Moonachie, New Jersay, October 30, 2012, after superstorm Sandy. 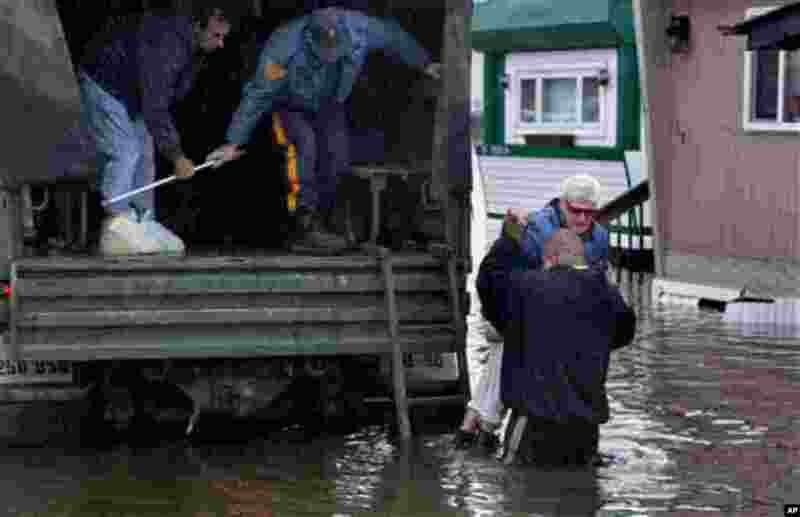 6 Elaine Belviso, 72, is rescued from her flooded home by Suffolk County police after being trapped there overnight by superstorm Sandy, October 30, 2012, in Babylon, New York. 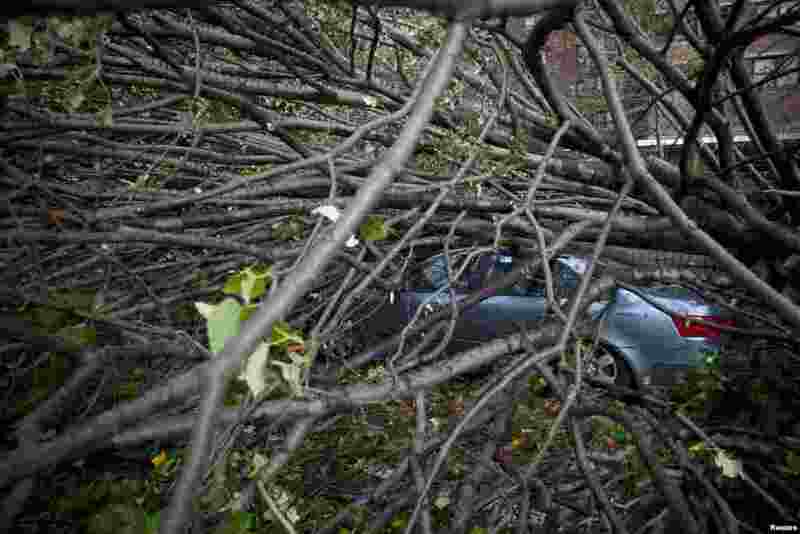 7 A car is crushed under a fallen tree in the Lower East Side in the aftermath of Hurricane Sandy in New York, October 30, 2012. 8 A dead deer is pictured with driftwood and debris left by a combination of storm surge from Hurricane Sandy and high tide in Southampton, New York, October 30, 2012. 9 Boats lie piled up as people work to secure a fuel dock in the wake of superstorm Sandy, October 30, 2012, in West Babylon, New York. 10 Sand and debris cover a part of town near the ocean in Atlantic City, New Jersey, October 30, 2012, a day after Sandy made landfall. 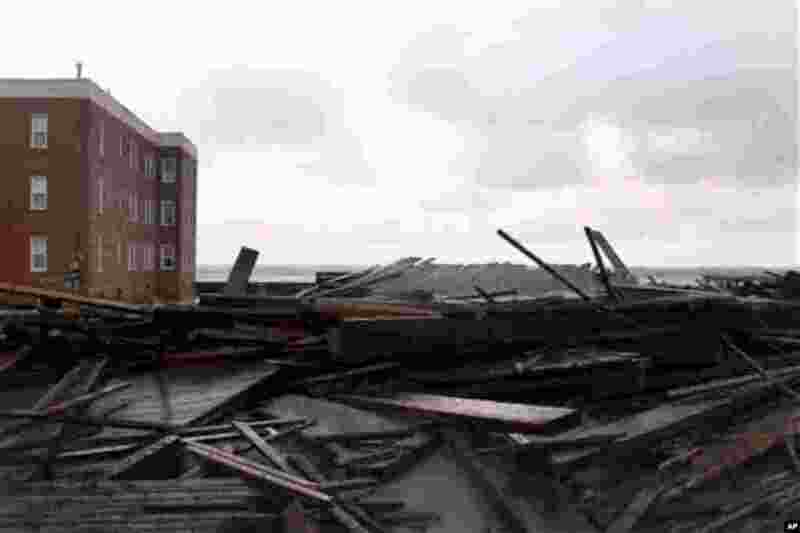 11 Large chunks of the boardwalk are piled near an apartment building on the ocean in Atlantic City, New Jersey, October 30, 2012. 12 Kim Johnson looks at the destruction left by Sandy near her seaside apartment in Atlantic City, New Jersey, October 30, 2012. 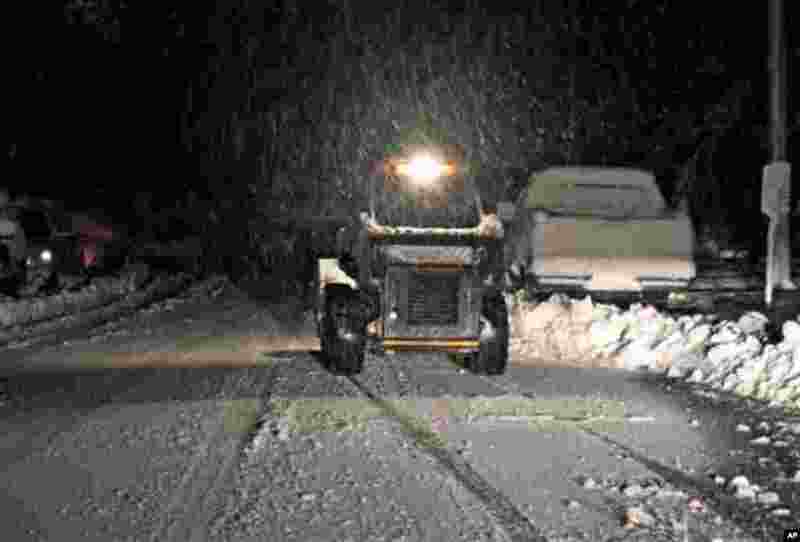 13 Snow falls in Elkins, West Virginia, October 30, 2012, a day after Sandy slammed the eastern coast of the Unites States. In some parts of West Virginia, the collision of multiple storm systems could produce up to 3 feet of snow. 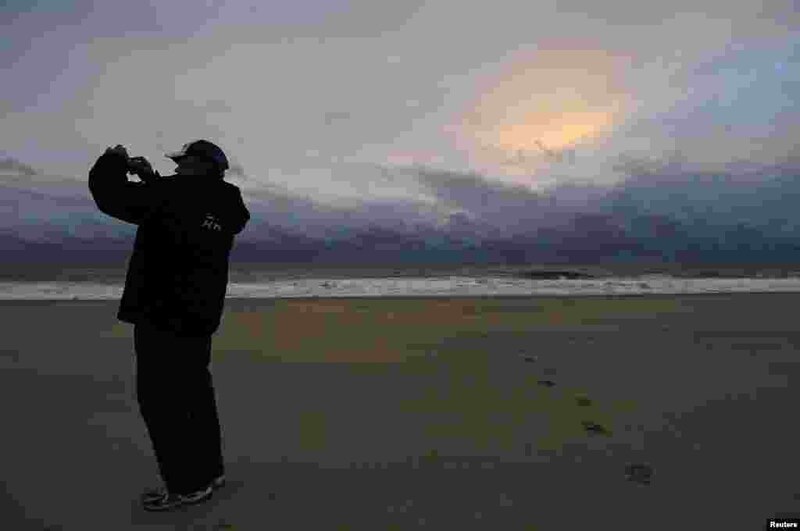 14 A man takes a picture of calm seas and sun-dappled clouds in the aftermath of Hurricane Sandy, at sunrise on Rehoboth Beach, Delaware, October 30, 2012. 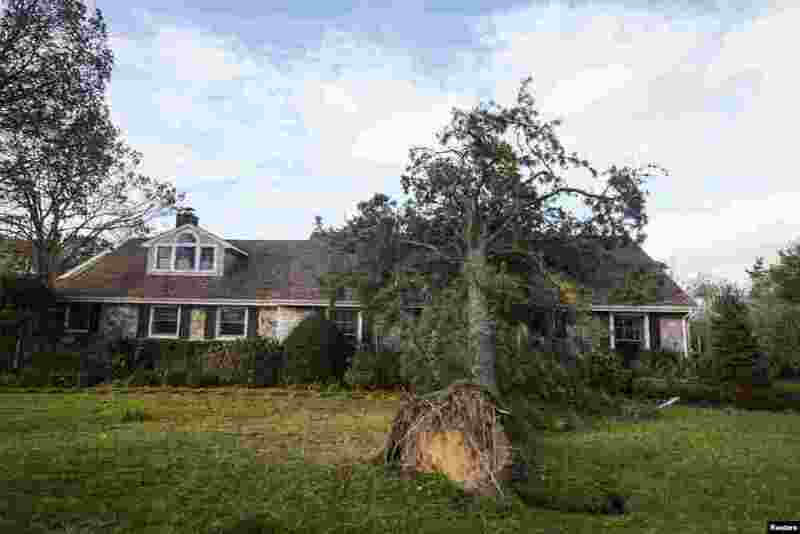 15 An uprooted tree lies on top of a home after being pushed over by winds from Hurricane Sandy in Westhampton Beach, New York, October 30, 2012. 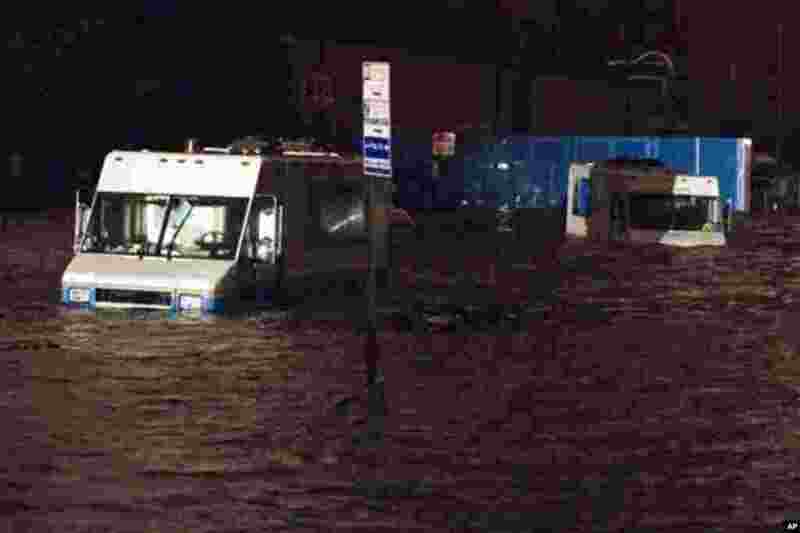 16 Consolidated Edision trucks are submerged on 14th Street near the ConEd power plant, October 29, 2012, in New York. Sandy knocked out power to at least 3.1 million people. 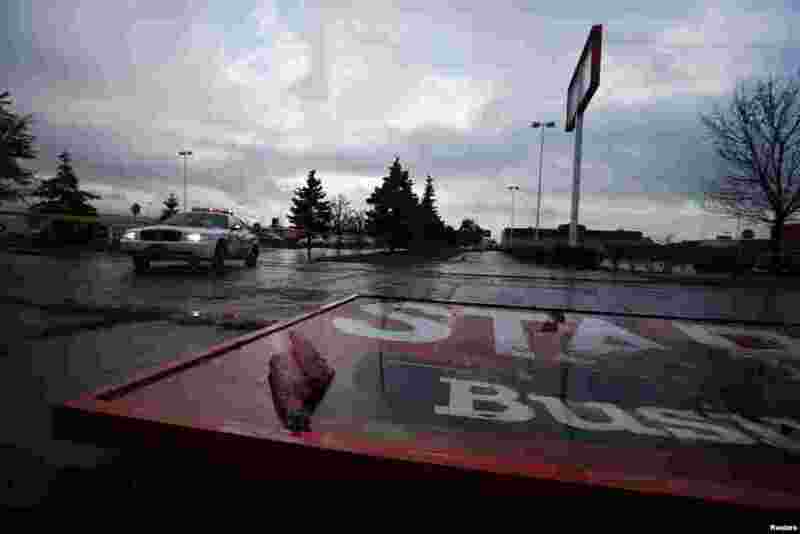 17 Sandy also impacted Canada, where flowers are left at the Toronto site where a woman was killed after being hit by a flying sign that shook loose due to high winds from the remnants of the hurricane, October 30, 2012. 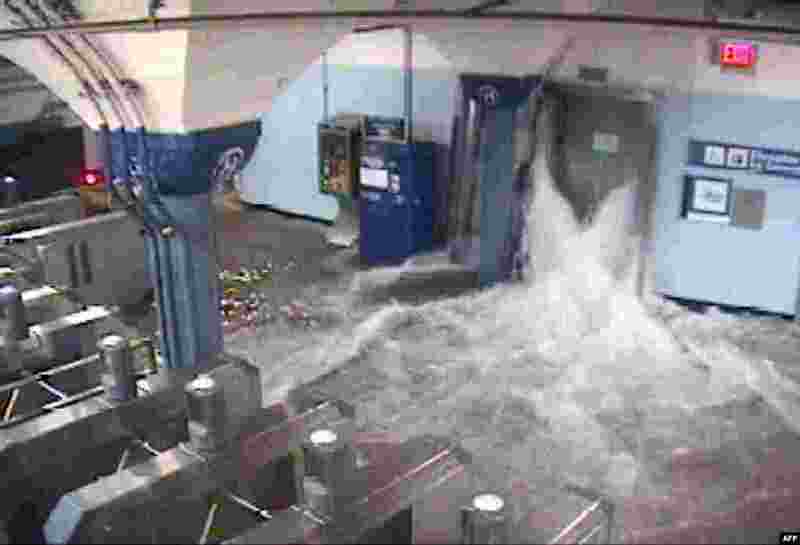 18 This CCTV photo released by the official Twitter feed of The Port Authority of New York & New Jersey shows flood waters from Hurricane Sandy rushing in to the Hoboken PATH station through an elevator shaft on October 29, 2012 in Hoboken, New Jersey. 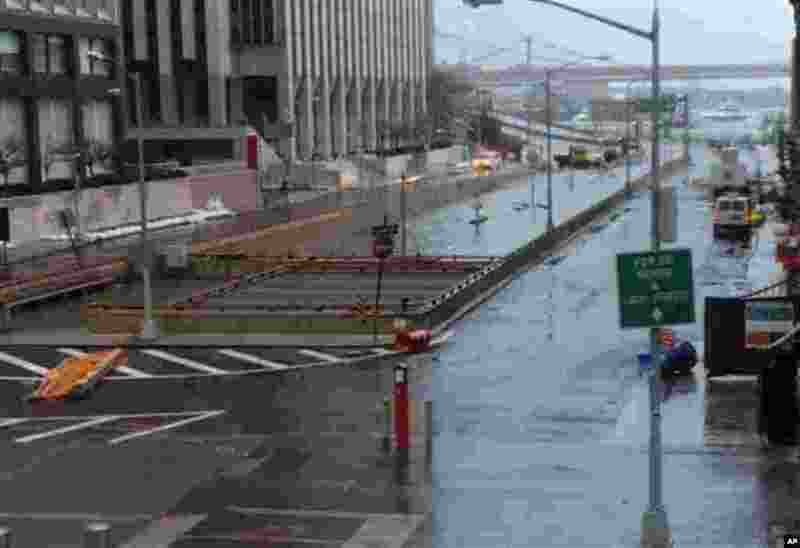 19 This photo provided by MTA Bridges and Tunnels shows floodwaters from Sandy entering the Hugh L. Carey Tunnel (former Brooklyn-Battery Tunnel), which was closed, October 29, 2012. 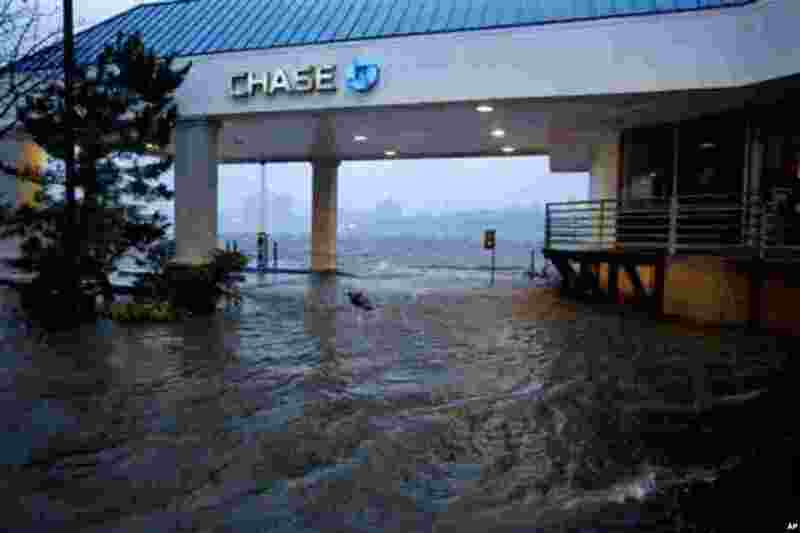 20 Rising water from the Hudson River overtakes a bank drive-through in Edgewater, New Jersey, October 29, 2012, as Hurricane Sandy lashed the East Coast. 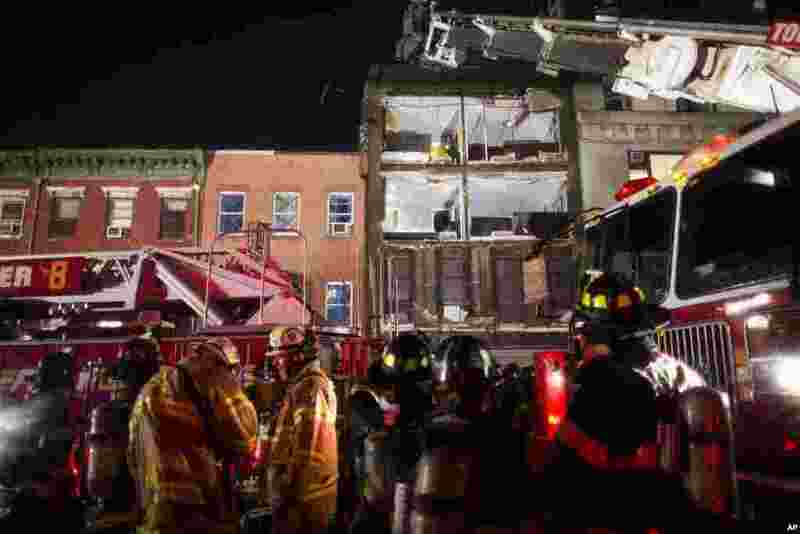 21 The facade of a four-story building on 14th Street and 8th Avenue collapsed onto the sidewalk as FDNY firefighters respond, October 29, 2012, in New York. 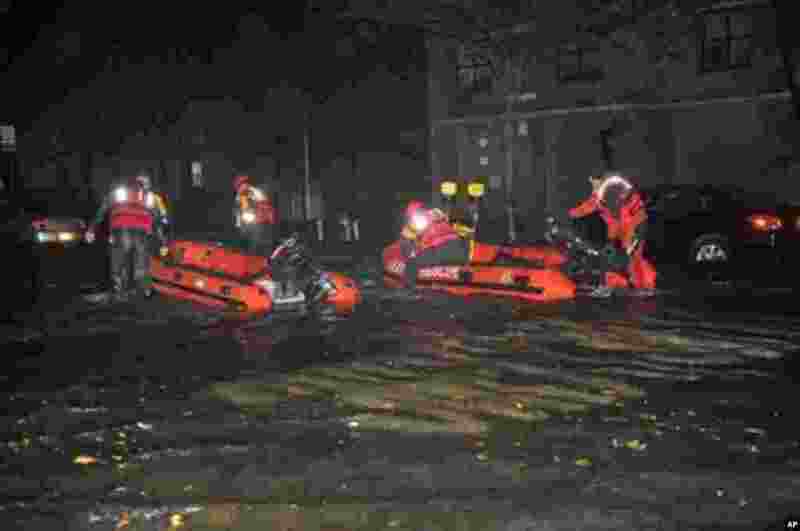 22 FDNY inflatable boats travel along 14th street towards the East River on a rescue mission in the wake of Hurricane Sandy, October 29, 2012, in New York. 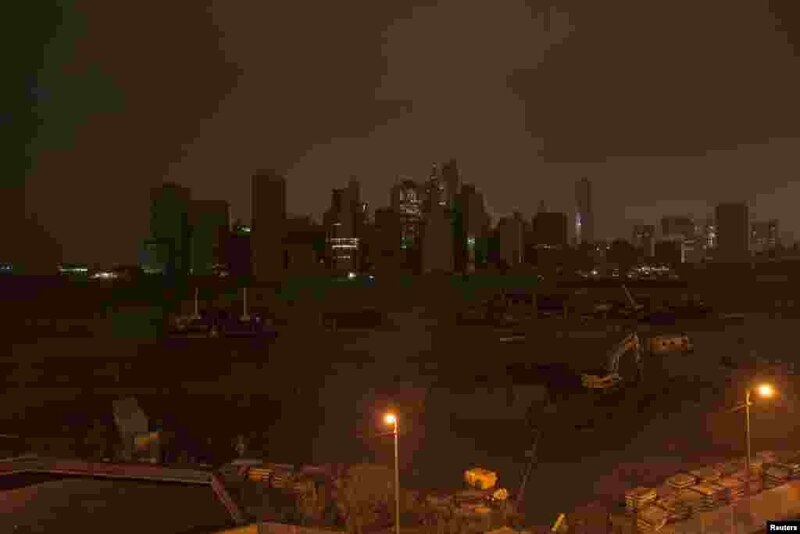 23 The skyline of lower Manhattan sits in darkness after a preventive power outage in New York, October 29, 2012. 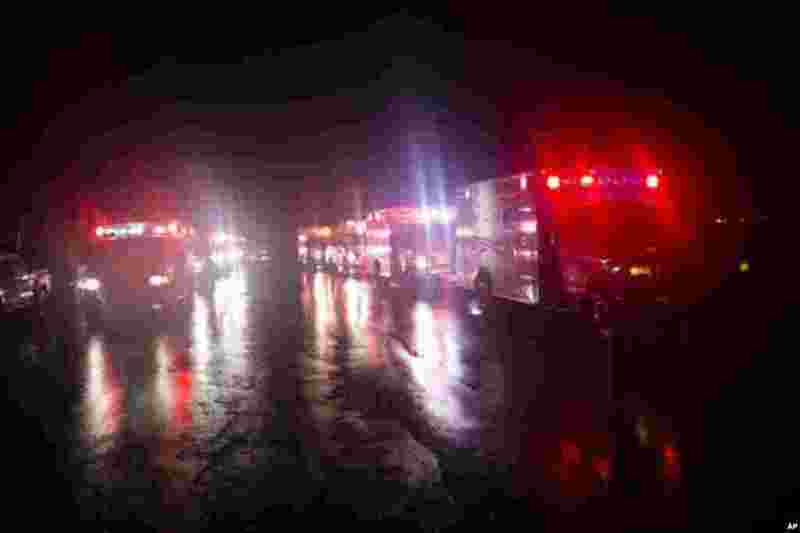 24 Ambulances line up outside New York University Tisch Hospital during an evacuation of the hospital after its backup generator failed when the power was knocked out by Sandy, October 29, 2012.